Today, the data is catching up with the experience. Studies have found that prenatal massage can be an effective path to control anxiety and depression while bringing much-needed relief for aching muscles and painful joints. Thanks in part to Audrey, today Heidi has a healthy girl and boy. Researchers working over the past decade have concluded that the relaxation and stress reduction that can result from regular massage therapy also can produce an improved prenatal hormonal state. Pregnant women who schedule regular massage may find themselves less moody while enjoying improved cardiovascular health so crucial to the health of the newborn child. Outside of everyday life and work, a pregnant woman’s body is subject to significant metabolic and muscular change. Swedish massage and other prenatal techniques in our repertoire help offset the common aches and pains that occur during a pregnancy and can help the expecting mother achieve a better hormonal balance. “As your baby begins to grow you will experience many different sensations throughout your body. During your massage session we will discuss how you are feeling, both physically and emotionally, and what position will be the most comfortable on the table,” explains Heidi, who, after all, has been a receiver as well as the giver of expert prenatal massage. Correctly applied to different muscle groups of the body, prenatal massage stimulates lymphatic and blood circulation while relieving muscle tension. Stress hormones norepinephrine and cortisol were reduced in a study of pregnant women who received five weeks of bi-weekly massage, while depression-associated hormones of dopamine and serotonin were observed to increase. The optimal changes in hormonal rates are also associated with fewer complications during labor and healthier birth weights of newborn children. “Usually after 15-18 weeks laying belly down becomes uncomfortable so we will switch to a side-lying position. In this position you will be surprised at how relaxed you feel, as well as how I can access many pressure points located in the neck, shoulder, lower back, hips, and glutes. “As you near the end of your pregnancy in your third trimester, you will notice more swelling around your ankles and feet. During this time, I work with gentle and repetitive lymphatic techniques to encourage that fluid to flow back up the legs thereby decreasing swelling and stiffness. The end result for you is more freedom of movement, greater ease and function as well as relaxation and calm. Reduction of stress, anxiety and depression. Reduced Edema (swelling of joints) that may be caused as increased pressure by the expanding uterus impinges on major blood vessels, reducing circulation. Reduced nerve pain by stimulating the lymphatic systems to speed the processing of tissues waste and reduce buildup of fluids in joints. Better control of sciatic nerve pain as the growing uterus presses again muscles of the pelvis and lower back and spreads tensions to the upper and lower leg. Improved emotional stability with less stress, frustration, anger and anxiety. Improved oxygen flow to the soft muscles and tissues. Better and deeper sleep with improved appreciation of and tolerance for the prenatal process. First trimester of the pregnancy. 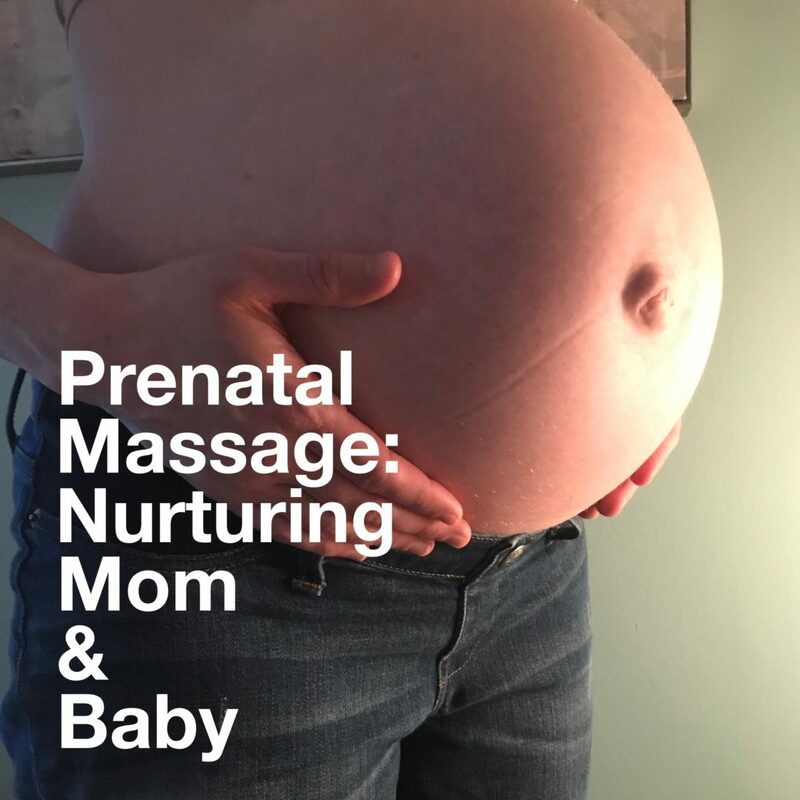 “When you coordinate a program of professional prenatal massage therapy with the tests and recommendations of your doctor, you can more effectively manage your comfort and health and the health of your child through term,” explains the 20-year veteran licensed massage therapist. “It certainly helped me enjoy my pregnancy and to bear the healthy children I am so thankful to have,” Heidi says.